A University of Southampton expert in tectonics is helping to lead a major investigation in one of the most seismically active areas in Europe. 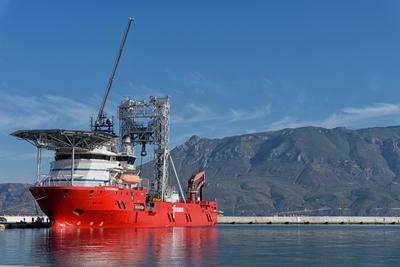 Southampton Professor Lisa McNeill is Co-Chief Scientist on the Corinth Active Rift Development expedition which leaves the port of Corinth in Central Greece on Friday, 20 October on board the drilling vessel Fugro Synergy. It is in the Corinth Rift, located in the Gulf of Corinth, that one of the Earth’s tectonic plates is being ripped apart causing geological hazards including earthquakes. This rifting process is the focus of the International Ocean Discovery Program (IODP) Expedition 381 which Professor McNeill will co-lead with Professor Donna Shillington of the Lamont-Doherty Earth Observatory of Columbia University in the USA. Continental rifting is fundamental for the formation of new ocean basins, and active rift zones are dynamic regions of high geohazard potential. The Corinth Rift, Greece, is a unique laboratory situated in one of the most seismically active areas in Europe. Geologically the Corinth Rift is a very young tectonic feature, forming in the last five million years. The main rift today is situated across a marine basin, which, with its high rates of activity, closed drainage system and high sedimentation rates, makes it an ideal location to examine the earliest phase of rift formation and how the landscape responds to tectonic and climate forcing factors. During the expedition, an international team of scientists will collect cores at three different locations, drilling up to a depth of about 750 meters below the seabed. The expedition in the Corinth Rift will last for about eight weeks. The overall aim is to gain an insight into the rifting process by recovering sediment cores and data of the properties of the borehole materials. The cores, which will represent about 1 to 2 million years of sediment deposition, act as archives as they are capturing and recording the geological history in their composition, age and structures. • Natural Hazards – As one of the most seismically active areas in Europe, what are the implications for earthquake activity and earthquake potential in a developing rift? • Structural Evolution – How does the rift actually evolve and grow and on what timescale? How did the activity on the rift faults change with time? • Surface Processes – How does the landscape respond to tectonic and climatic changes? • Past climate reconstruction – What was the climate in the Eastern Mediterranean and the environment of the rift basin in the last 1 to 2 million years? “We are very excited to get started with this expedition, after many years of planning by many scientists from around the world,” said Professor McNeill. “Researchers have been working in the Gulf of Corinth region for many decades, examining sediments and active fault traces exposed on land and using marine geophysics to image the basin and its structure below the seafloor.